When I visit with my 94-year-old spiritual director, I sometimes hold my breath while she speaks because I know she has a lifetime of wisdom to offer. She’s raised seven children, was widowed in her 60’s, still lives on her own, does yoga, and is writing her own book. The last time I visited, she paused and said, “You know, the truth is—all of life is really just transition.” Even, she said, when we decide something in our house decor just doesn’t feel right anymore, and we move things around just a bit—it’s all transition. All of life is transition. Movement. “Our lives are full of tiny deaths and tiny resurrections,” the pastor at the church we attend said a few weeks ago during Lent. Sometimes we plan those changes, and sometimes we don’t. We plan graduations and weddings, not bereavement or job loss. Sometimes they are dramatic, and sometimes subtle. “Isn’t it funny how day by day nothing changes, but when you look back, everything is different,” wrote C.S. Lewis, and sometimes change is like that. Like the way you look back at videos from just a year ago of your child, and realize she is gone. Someone wearing her first pair of heels on Easter Sunday has replaced her. Transition can even show up in the form of anxiety or depression. When we medicate or numb ourselves, we often miss what our emotions are telling us: it’s time to change. This isn’t working anymore. Evolve to the next level. Rather than going into fight or flight, we can pause and just listen to these restless guideposts. When my husband died, I thought people expected me to progress like someone in a Hollywood film. I would one day get a new haircut, the music soundtrack would pick up, and I’d drive off to a new life- the camera panning out as my car crossed a bridge. That kind of transition felt cheap and perverse. Thankfully, real life mirrors nature more than films. It is paradoxical, but anything but cheap. Not resuscitation, but resurrection. It is long: sticky cocoons and hiding. 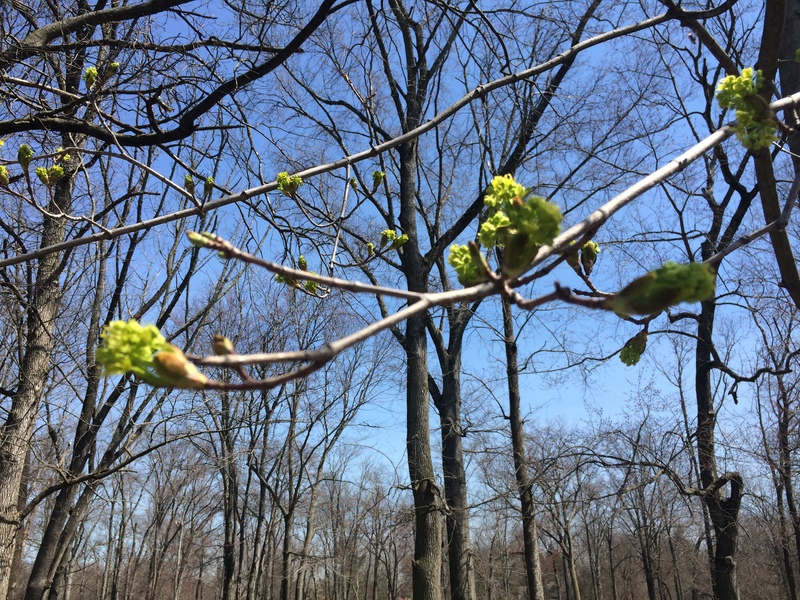 It is ephemeral: sudden blossoms, seemingly out of nowhere—gone in a few days. It is dark and holy. We go through Good Friday to get to Easter Sunday. While some of life’s transitions are marked with small ceremonies or acknowledged in some way, most are not. Most happen in our dimly lit interiors, with only small outward signs of the change. Sometimes we’ve been in the tomb for so long, we need someone to call us out by name. Like Martha at Lazarus’ tomb, we may even resist the resurrection. “But Lord, … he has been there for four days.” If we’ve been in survival mode, hiding in a foxhole, the light of day is blinding. Richard Rohr, in his book, “Falling Upward,” talks about a custom in post WW II Japan that helped Japanese soldiers returning to their communities to reenter society more smoothly. In a ritual the soldier was publicly thanked and praised for his service and then it was declared over him, “The war is now over! The community needs you to let go of what has served you and served us well up to now.” Rohr calls it “discharging your loyal soldier” in his own work with men. All of life is transition. Living a life of tiny deaths and resurrections, in a society lacking rituals of almost any kind, I think we must start to create our own. They don’t necessarily need to be communal, but they do need to be acknowledged. When they are not, depression and anxiety will take that place, relationships and marriages will be strained, and we will go on alternating between numbing and striving: consuming and lengthy to-do lists, and seeing how we measure up to everyone else on social media. So beautiful, Julia! Thank you for this. All is so true. And made me think, like everything else in creation, resurrection is organic. We need to celebrate these changes, these new signs of life. Really good point- organic. Definitely gives me more to meditate on! Thanks for that Sonal. xoxo. I know that in many cultures, there is often an elaborate ritual and a period of mourning for the loved one that has passed. Even something as pinning a black ribbon on the clothes for a month could communicate the sense of loss. I wonder if the lack of acknowledgement reflects somewhat on our pain avoidance culture. If “happiness” and the “american dream” is our goal, then there is little place for the “surprises” and interruptions in life. It is so true and freeing to know that all of life is transition, and that there is grace for each tiny deaths and resurrections! “pain avoidance culture” yes. And yes, there is grace.